Many panel-mounted process or temperature PID controllers have the capability to communicate via RS-485 serial communications. 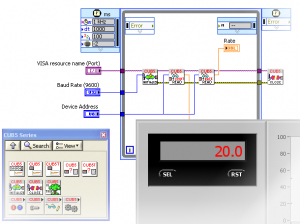 Interfacing with LabVIEW™ is a quick and low-cost way to add supervisory control and data acquisition (SCADA) to one or more loops in a process control application, or to integrate DIN-sized controllers into test setups in a laboratory environment. 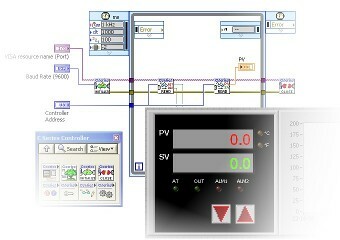 Simplify your automation programming by using our LabVIEW™ Process Controller Communication Libraries to add drag and drop, instrument driver style VIs to your LabVIEW programming. This VI library contains VIs (Virtual Instruments) and example code for implementing communication between National Instruments LabVIEW™ and one or more Red Lion® Controls* CUB5 series panel meters via RS‐485 serial bus. The library also supports communication via USB or RS-232 serial to a single device.